How to Crack the Glass Ceiling? 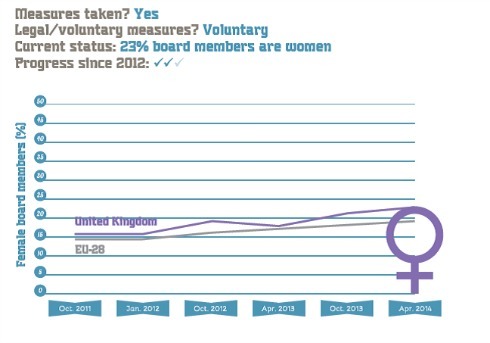 As part of the European Women’s Lobby’s Beijing+20 focus month on ‘Women in Decision-Making’, February 2015 saw the launch of the EWL’s latest report entitled ‘Women on Boards in Europe: Second Progress Report. Cracks in the glass ceiling or just a trick of the light?’ Alys Mumford on the Engender site gave an excellent précis, which I have précised even more! The original post is here. The 2011 The Davies Review has encouraged companies to voluntarily commit to raising the proportion of women on company boards. Reaching the target of 25% of women on boards by 2015 is seen as essential to ‘prove … that British business (can) fix this on their own’ and in order to avoid legislative quotas at the EU or national level. In other words, if companies don’t do this on their own initiative, they will be forced to by legislation. A circumstance that I feel incredibly comfortable with as you can see here Quotas for Women on Boards? Yes, yes and yes! While as a group, the FTSE 100 companies are on track to meet the 25% target in 2015, success is concentrated in a few companies and there are still 61 FTSE 100 companies who fall short of this target. Progress is heavily weighted in non-executive directorships – 27.9% of non-executive directorships among FTSE 100 companies are held by women, in comparison to 8.4% of executive directorships. In smaller companies, the situation is far worse. Among the FTSE 250 group, only 17.4% of board members are female and there are 29 companies with no female directors at all. It is not easy for companies which have not embraced gender diversity at the grass roots to suddenly find enough competent women for board membership. Forward thinking companies are already paying attention to its female workforce and starting at entry level. The RenewYou programme is specifically designed to address an oft cited factor ‘women lack confidence to progress’. It’s a debatable point about why women lack confidence and I’ve written on it often. Nonetheless it’s there and companies need to take measures which ensure their female staff can compete and advance on an equal basis as the men. And those that do are the companies that will thrive. RenewYou is my tried and tested one day course for women, delivered by a network of excellent trainers across the UK and beyond (USA, Australia, South Africa…). One day really can make a difference. Dates here.